Our friends at MRCagney have created a few really neat tools recently – including this taxi cost calculator – and now they’ve created another one. 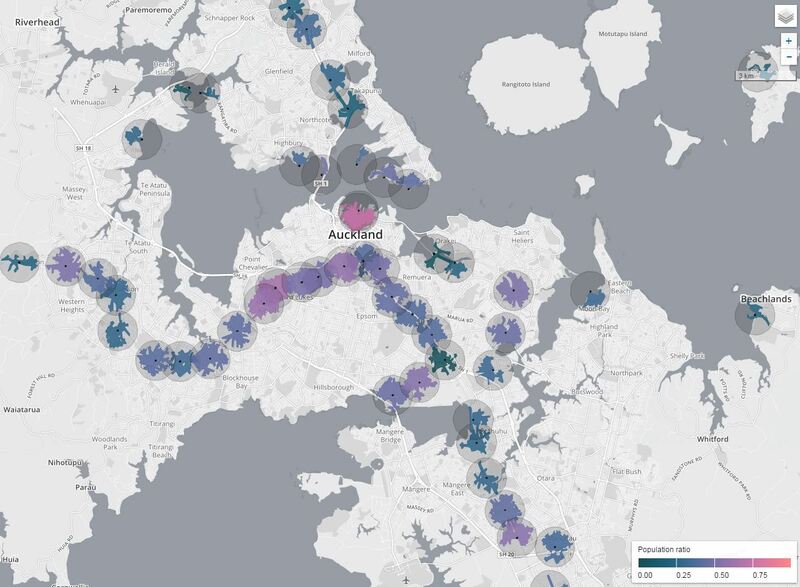 This time looking at the pedestrian catchments of all of Auckland’s train/busway stations and ferry terminals. It shows how far you can get by walking 1km (10-15 mins walk) compared with a 1km crow flies distance. You can see the tool for yourself here using the login and password of demo to access it. The map below shows the Population ratio filter and as you can see, with the exception of some of the inner western line stations, most have less than 50% of people from within 1km away actually within a 1km walking distance. The walk up catchment for the Rapid Transit and ferry services only covers a very small area of Auckland. Finding ways to not only expand the system but to expand the walkability of stations would go a long way to addressing this. It would be interesting to see what this would look like with the proposed Light Rail lines and proposed future Rapid Transit lines added in. The former would see much of the central isthmus within walking distance of a very high quality PT service while the later would see a lot more areas filled in with rapid transit. One of the big issues with ferries is that normally 50% or more of their catchment is water. This is even more so when with many of the peninsulas in Auckland. The effect of this is that it really limits the amount of walk up catchment that can use services. Perhaps one of the most damning views is the filter showing the areas for residential growth in the Unitary Plan. As you can see, with the exception of primarily New Lynn, Glen Eden and Henderson, there’s not that much growth proposed or allowed. We should be allowing for a lot more growth around major PT notes. There are a couple of minor errors (such as walking lines along the busway) and things I’d like to see such as the ability to choose a different distance comparison e.g. 2km, 3km however all up this is very useful and hopefully will be able to help highlight areas where AT can focus on to improve walkability. Wow – the ferry catchments are tiny! I get that the ferry route needs to be kept short, but the northcote & birkenhead stops in particular just seem terribly located. Well, 1km is a pretty short distance. I have an apartment at the top of Hinemoa St. – more than 1km from the Birkenhead Terminal at the bottom of Hinemoa – however, I have never considered myself out of the catchment. A 15-20 min stroll is hardly overly arduous. In fact, it’d do a lot of Aucklanders a great deal of good. I’d be curious to see the catchment for the proposed CRL stations and Parnell included too. Also, this map is perhaps the clearest argument yet for a well-connected street grid in our suburbs – especially those inner western line stations. Why is the deep south always left out? We use public transport …truly. The doors on the 8:08am train at rewa on the electric train where having problems closing because so many people were on the train (and people were left behind). “Because Auckland is a portrait shaped city in a landscape screen world” Very poetic Matt! andy all stations are covered by the tool, click on the link and have a look. Matt has just cropped his screen grabs for ease of use. Both Meadowbank Station and Orakei are both peninsulas like the Ferry terminals are hence their limited walkup-ability. The Tamaki Dr to GI cycleway should help improve the connections there a bit especially from Meadowbank north, but not by that much when a 1 km long walk path is included. As that won’t even reach Kohimarama road. Really Meadowbank station is in the wrong location, as if it was further east, its circle would just about overlap the GI station one. And especially important as that former Eastern Transport corridor land on the GI side will turn into housing sooner than later. GI itself is reasonably well connected to its catchment – more by luck than good management I suggest – which means that UCF project to improve walking/cycling links within 1 km of GI will have it work cut out to make that much more efficient than it is now – the UCF project can make it a lot safer though to wlak and cycle more, which is itself a good outcome. Even better if the GI township is intensified well so that the catchup goes up. GI is a case of wasted potential though. There are no bus services to areas like Glendowie, despite Riddell Road offering an ideal shuttle loop as per the current 76X route shows. The station there is also rubbish and it’s frustrating when you compare to to the amount of work that went into doing up Panmure. Yes Meadowbank needs to go east up the hill, also so it can connect with buses on St John’s Rd. Not a cheap operation however. Gi has a potentially much bigger catchment; all the way out to Glendowie on one side and Stonefields on the other. There is much that can be done to connect these more distant areas with this station, which afterall offers a ready direct, quick, and now frequent journey both north and south. Parnell is an obvious gap. Cycling is the next obvious metric. 3kms is nothing on a bike with good safe routes and secure storage at the stations. Oh and of course the glaring great hole is midtown! The biggest concentration of employment in the whole country, and a growing concentration of habitation too. Aotea and K Rd stations will do that nicely, such dense areas benefit from overlap. And the missing NW transit corridor. Damn shame. From memory there was a new bus service launched recently that loops around Stonefields and back to Glen Innes, which is a smart idea. We just need it one out to Glendowie & St Heliers and then it would actually catch quite a few houses that currently have limited access to rail without catching two buses and a 700m walk to get it (and by the time you line those buses up you could almost be in town, assuming you want to go there). Won’t these problems be addressed with the feeder bus services to the central links? I understood that the feeder buses were designed to put 90% of households within 500m of PT. PS when do the new bus routes come into effect (Particularly for Papakura Takanini areas. I think the catchment area for sunnynook station is a bit off. Is it meant to represent a 1km zone and 1km walk or less? If so its wrong. I live on Cockayne cr and the zone should extend a lot further out than this. I’m only a 10 minute walk from either of two stations, but I’m shown well outside the catchment, so the distance would appear to be very understated. A significant portion (perhaps half?) will be walking from more than 1km, I’m sure. I agree, a variable distance option would be great. You must walk faster than 6km/h then. Remember Sunnynook station is walk up ONLY. Kiss and Ride assumes someone else wants to drop you off. No connecting crosstown services and set to continue with the new timetable. And parking 700m away at Sunnynook Park (hardly used week days) is set to be restricted as well, forcing those commuters into on-street parking. It’s my closest station but too far for me to walk, parking is being removed and no linking transport. The new transport plan also removes choice from my current route down Forrest Hill to town via Smales. What am I supposed to do? I live on Sunnynook Road about 1.2km from the station. The downhill walk is manageable but the return uphill at night or in the winter is a real put-off. I agree the lack of connecting buses is very poor. I submitted on the new proposal which removes the only (infrequent) bus service when this is the only bus station which can be served by feeder services which do not get caught in traffic heading to the motorway. AT are proposing that Platforms 3 and 4 on Sunnynook Road become redundant – exactly the opposite of what should happen. There is a big opportunity going to waste here. I would really like to see the stats on use of the bus stations as Sunnynook is very well used despite being the smallest and virtually walk-up only. Yes, if I understand the proposed network Sunnynook Rd is on a bus between Constellation and Smales, so a super easy connection. Better than that, I currently have the 873X and 874X pass close by, down Forrest Hill and via Smales straight to town. No NEX crowding for me. BUT the new regime will have the 873 looping through Milford (!) and via Takapuna into town. Why would someone in the ‘Nook want to go that way to service termination in the city?!? So the 873 will be empty until it’s somewhere near Crown Hill. Everyone else will want to go down Forrest Hill. The 874X will terminate at Smales and for both routes frequency decreases AFAICT. I don’t mind transfers but everything else is a negative. And they’re slowly turning Sunnynook Station into a ghost station, killing it by Death From A Thousand Cuts. Being in Mt Wellington, we are almost exactly halfway (~1.7km walk) between the Sylvia Park Eastern train line & also the southern line at Penrose, pretty good flexibility with the extra Onehunga run as well….just a pity the walk is a little too far & safety at night from Penrose not so hot…do a lot of kiss and ride with the kids at either, also with the Panmure interchange. …cycling would be great if safer to either of those stations. Luckily we are building a busway. Hi guys, could someone point out to the MRC guys that the footpath from Sunnynook Bus Station to Kapiti Place is not on their map. Hi thanks for pointer. Just so people are aware, the ped network which underpins this analysis is sourced from open street maps. This is an (excellent) open source project that anyone can contribute to – so if you spot any missing links please let them know! Alan yes! So take that up with your elected representatives. Currently Williansom, Ross, Quax, etc are fighting hard out to not prioritise the Southeastern Busway, but speend all the money on a useless and place-ruining flyover instead. It’s like the way it is now because people in elected positions fight to keep it autodependent. I like the idea of consolidating Kingsland and Morningside around Rossmay Terrace. This would allow for larger/multiple platforms for big games at Eden Park. It would also allow for three main roads to be served by one station. Northcote and Hillcrest are not well served by the Northern Busway… the walk-up areas extend well to the east, but barely at all to the west. The proposed new network actually eliminates/reduces busses to these nodes. Needs a look… cycle ways the only saving grace at the moment. If Baldwin Rd and Morningside stations were amalgamated at St Lukes Rd that might provide an opportunity to rebuild the St Lukes Rd overbridge. At only 2 lanes on the District Arterial it is a major traffic bottleneck. Pity Auckland Transport didn’t know about this tool when they designed the new ‘walking distance’ maps they’ve put on the glass at railway stations. Great idea, poor execution as they’ve only used flying distance.